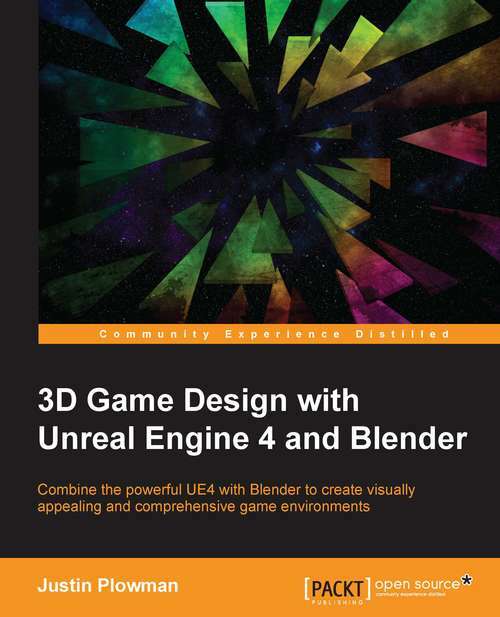 Combine the powerful UE4 with Blender to create visually appealing and comprehensive game environments About This Book * The only resource that shows how you can incorporate Blender into your Unreal Engine 4 Game environment * Create amazing 3D game environments by leveraging the power of Blender and Unreal Engine 4 * Practical step-by-step approach with plenty of illustrative examples to get you started immediately Who This Book Is For This book would be ideal for 3D artists and game designers who want to create amazing 3D game environments and leverage the power of Blender with Unreal Engine 4. 3D design basics would be necessary to get the most out of this book. Some previous experience with Blender would be helpful but not essential What You Will Learn * Create a fully functioning game level of your own design using Blender and Unreal Engine 4 * Customize your level with detailed 3D assets created with Blender * Import assets into Unreal Engine 4 to create an amazing finished product * Build a detailed dynamic environment with goals and an ending * Explore Blender's incredible animation tools to animate elements of your game * Create great environments using sound effects, particle effects, and class blueprints In Detail Unreal Engine 4 now has support for Blender, which was not available in earlier versions. This has opened up new possibilities and that is where this book comes in. This is the first book in the market combining these two powerful game and graphic engines. Readers will build an amazing high-level game environment with UE4 and will show them how to use the power of Blender 3D to create stunning animations and 3D effects for their game. This book will start with creating levels, 3D assets for the game, game progression, light and environment control, animation, and so on. Then it will teach readers to add amazing visual effects to their game by applying rendering, lighting, rigging, and compositing techniques in Blender. Finally, readers will learn how to smoothly transfer blender files to UE4 and animate the game assets. Each chapter will add complexities to the game environment. Style and approach This will have a clear, step-by-step approach to creating game assets in Blender and then importing them to UE4 to create stunning game environments. All asset creation techniques are explained in detail along with tips on how to use them to create your own game environments. The book offers end-to-end coverage of how to design a game level from scratch.